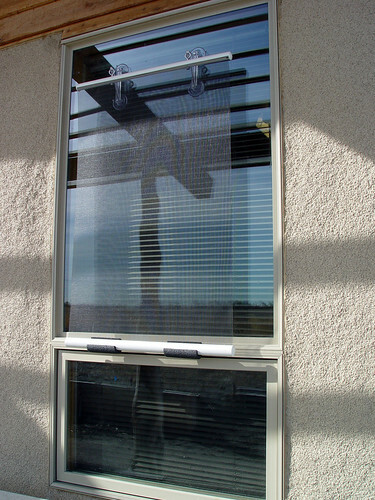 Bird-Killing Glass on the Vikings Stadium? Just Say No. For many years, I was a wildlife rehabilitator, licensed by the US Fish and Wildlife Service and the Minnesota DNR to help injured songbirds. 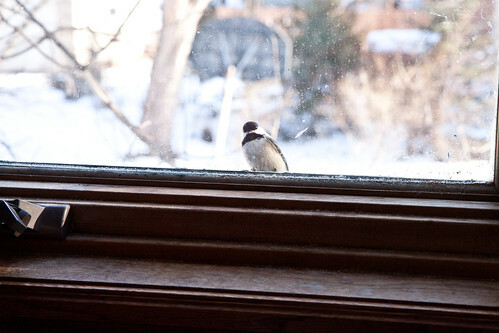 A disturbing number of the birds I received in spring and fall were suffering from head and spinal trauma from hitting windows. 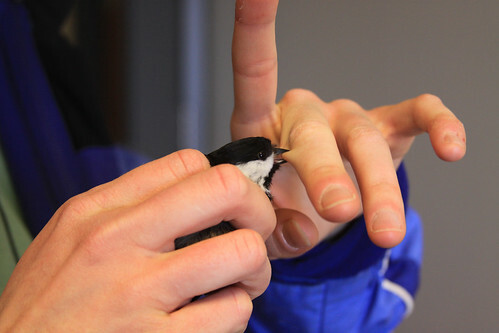 As I held birds that weighed barely a third of an ounce—you could mail three warblers with a single postage stamp—I could feel how heartbreakingly fragile they are, and also how despite their tiny size they embody some of the most thrilling elements of football: athleticism, endurance, and the physical and mental strength to overcome overwhelming odds. 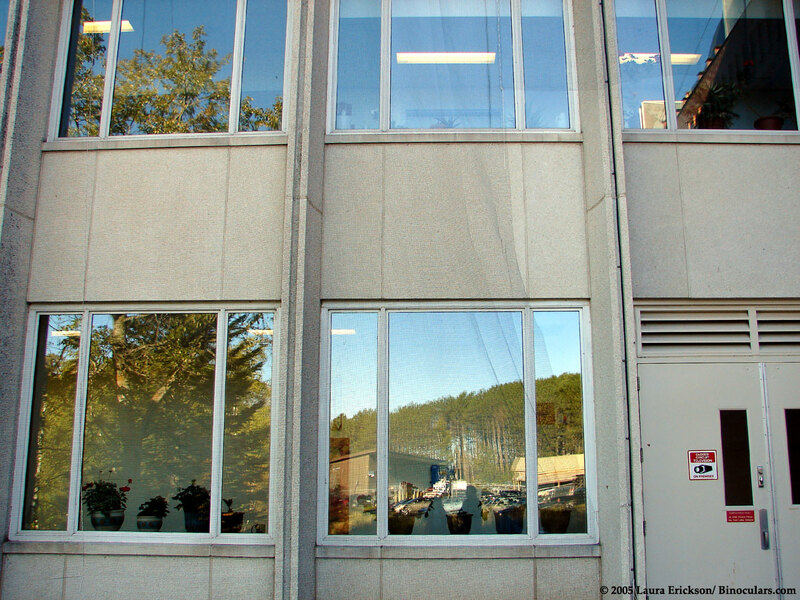 I’d look at a tiny Blackpoll Warbler in my hand and think about how every single Blackpoll Warbler ever seen in Minnesota during fall had come down here from its birthplace in the far reaches of Canada and Alaska—many had already traveled well over a thousand miles, and assuming that this one didn’t get killed, it would make its way to the Atlantic coast and then strike out over the ocean, averaging over 1800 miles on a non-stop flight to South America. Yes—non-stop, beating those tiny wings millions of times over treacherous waters without rest or food or the encouragement of fans or a coach, all the way to South America. 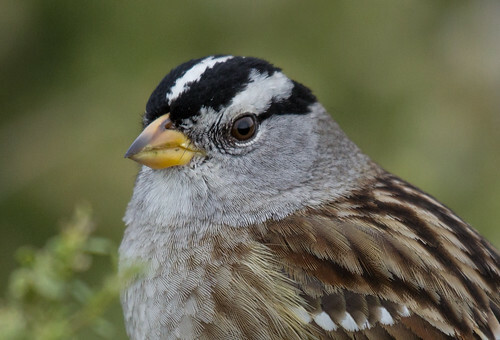 These birds are tiny but sturdy—those who aren’t gobbled by predators or killed in tragic collisions can lead surprisingly long lives. 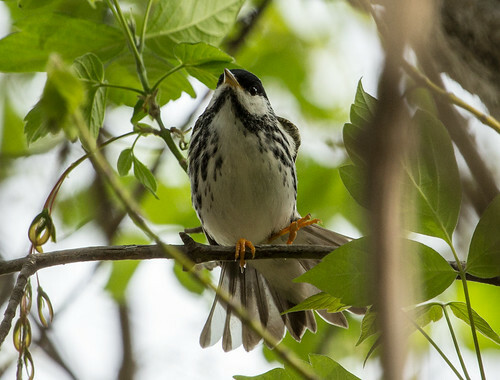 One of those Blackpoll Warblers banded as an adult in Alaska was retrapped, alive, when he was over 8 years old—his tiny little body had lasted more than twice as long as a typical NFL player’s career, and he was still going strong. 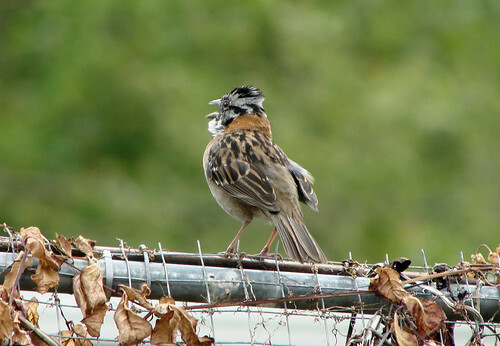 These little birds have pluck and guts, but no protective gear. They lead lives independent of us people—never asking for a dime, virtually never even visiting a feeding station or a birdbath. All they ask is that we let them go their way. That is not too much to ask, is it? 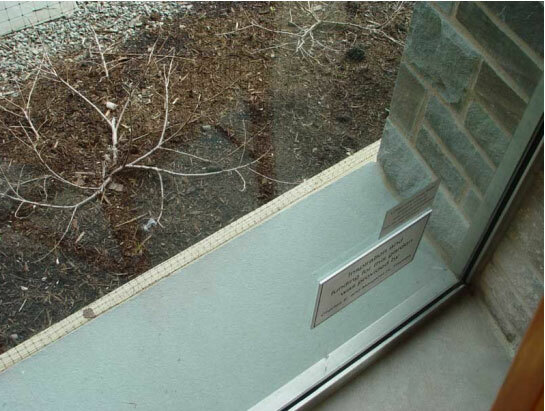 We didn’t used to appreciate the dangers of glass to birds. 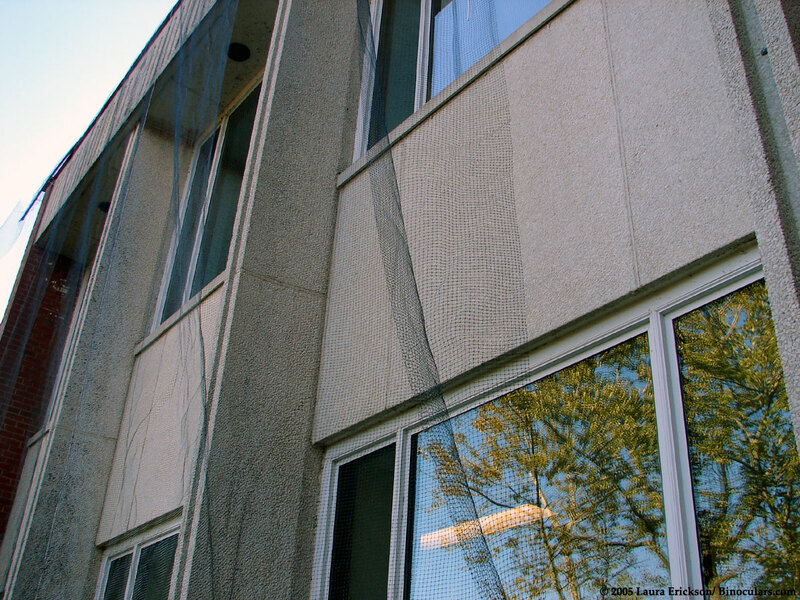 One of my friends, ornithologist Daniel Klem of Muhlenberg College in Pennsylvania, started researching the issue at the start of his career in the 1970s, and everything he has learned about bird-window collisions has made it abundantly clear that this is a most significant peril for migrating birds. 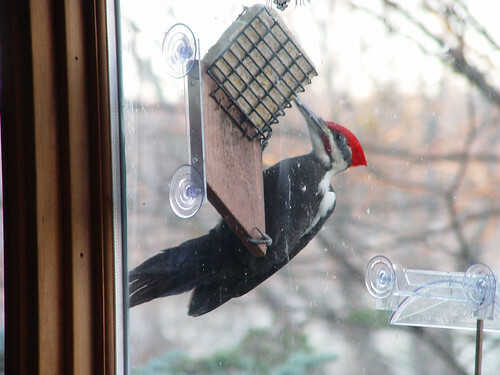 For decades his was the only voice out there talking about the dangers of glass, but in the past decade more and more ornithologists have done the research and affirmed just how treacherous glass is. 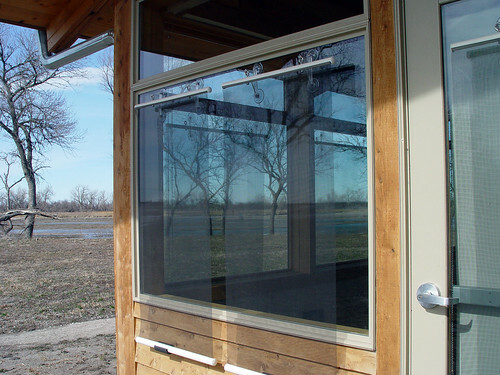 We can’t do very much at all about all the glass in existing structures, which is known to kill on the order of a billion birds a year. 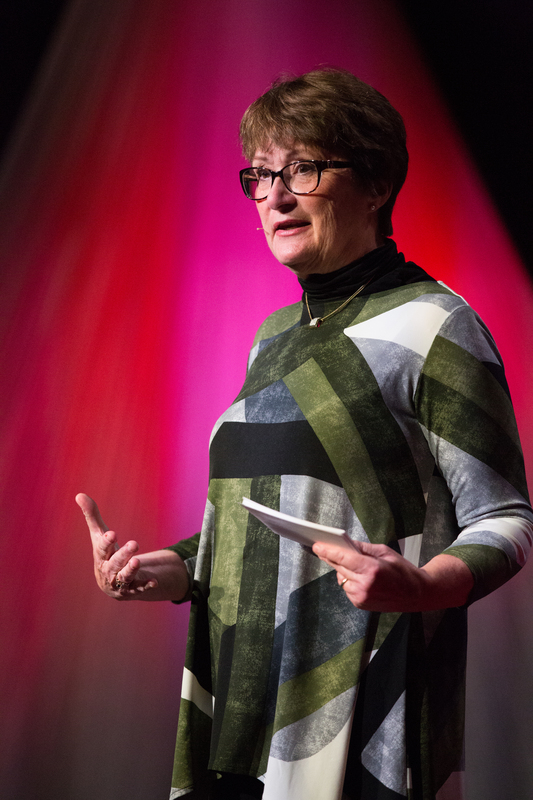 But now that we know better, why are we even considering sticking 200,000 square feet of shiny new glass right smack in the heart of a critical migration path? 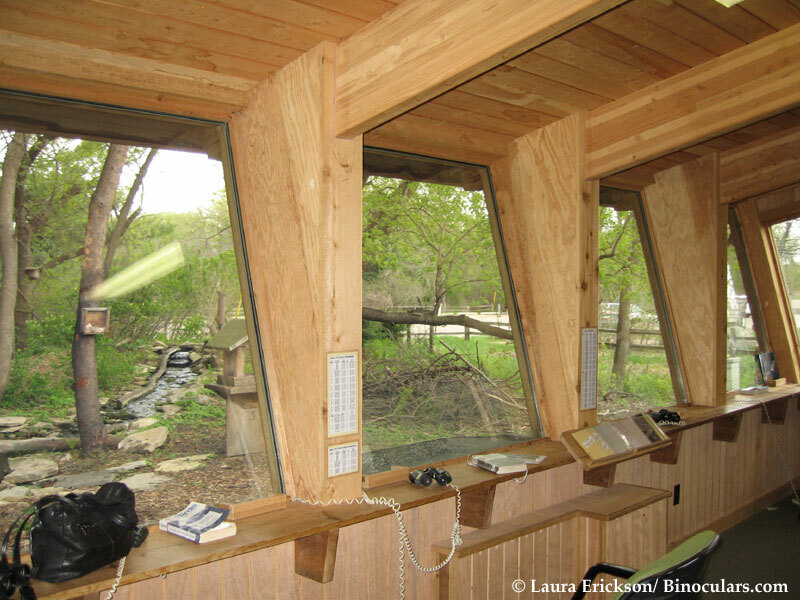 The Twin Cities has a long history of being a safe haven for birds, with our Minnesota Valley National Wildlife Refuge and our world-class bird rescue facilities—the Raptor Center and the Wildlife Rehabilitation Center. 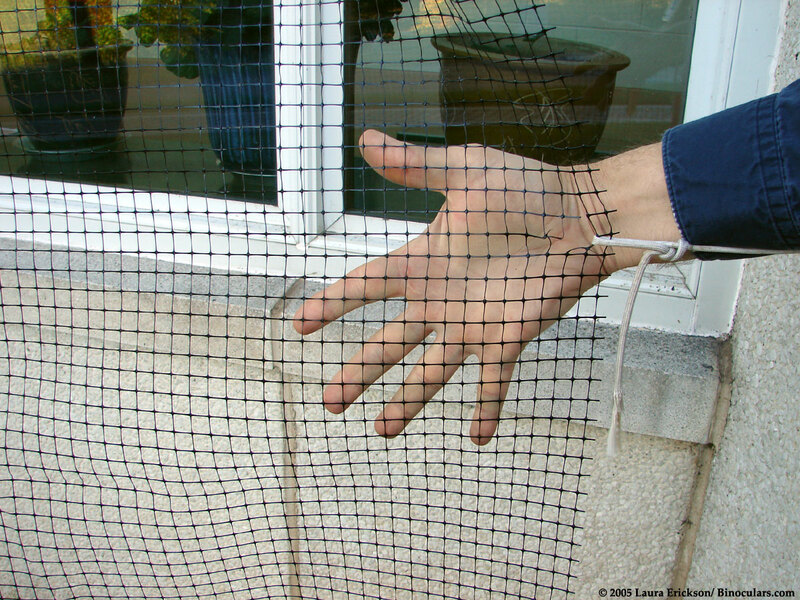 People look to us to solve bird problems, not to create them. 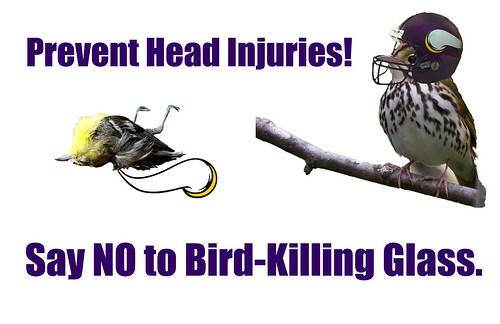 I can’t imagine that any of the Vikings players or their thousands of fans want the new stadium to kill birds. 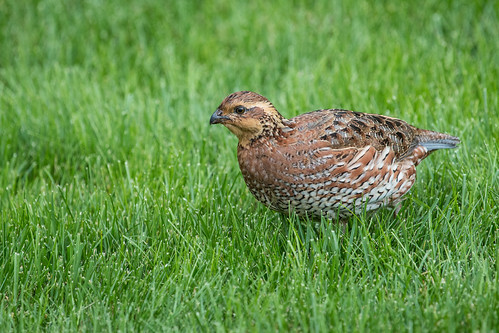 I’m sure none of the Minnesota taxpayers footing half the bill for the stadium want it to kill birds. If this is an issue of money, the cost of using bird-safe glass is insignificant compared to the cost of the stadium itself. I don’t understand how it can be an issue of esthetics. There are plenty of places to see the Twin Cities skyline. When people go into the stadium, shouldn’t the point to see the Vikings? How exactly do the thuds of crashing birds and the sight of dead and dying creatures littering the ground around the stadium fit into any reasonable person’s sense of aesthetics? This issue is as clear as bird-killing glass. Just say no. 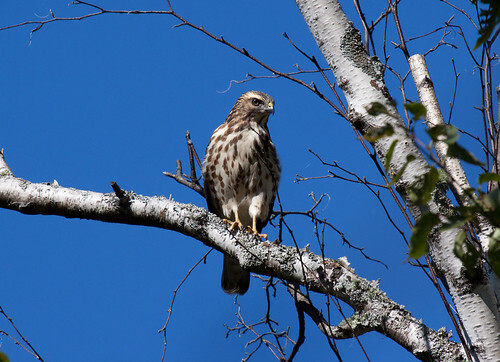 The Duluth-Superior area is so well known for our hawk migration and the amazing appearance of jaegers along Wisconsin Point every fall that we don’t pay enough attention to other cool birds passing through. 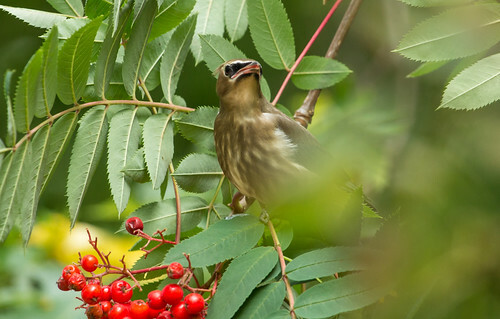 Right now the most exciting birds in my own neighborhood have been the hordes of waxwings and thrushes descending on mountain ash trees and other fruit-bearing trees and shrubs. 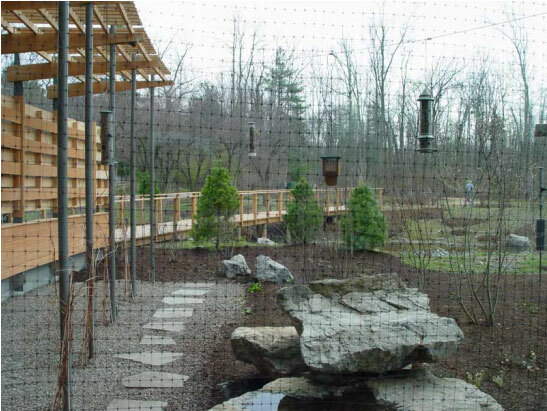 Up at Hawk Ridge, we can watch waxwing flocks numbering two or three to up to 40 or 50 passing through. Waxwings are shaped a bit like starlings, with triangular pointed wings, but are smaller and weigh less than half of what starlings weigh. That extra mass makes starlings powerhouses in flight, as you can see if you’ve ever seen a huge flock of them wheeling about in the sky—those YouTube videos showing enormous bird flocks forming bizarre shapes are starlings. Cedar Waxwings fly in a far more delicate, buoyant way. 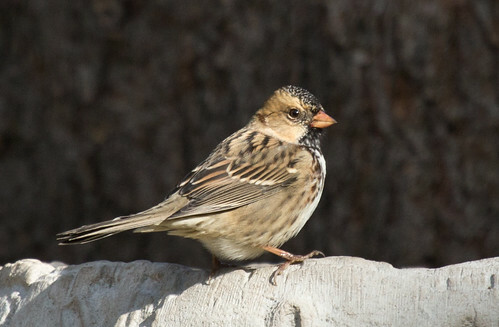 Their flocks seem to move in a much more leisurely fashion, and the way each bird shifts position relative to the others makes the flock appear to be gently swirling through the sky. Lovely as flying waxwings are, I love being where they set down for a spell in convivial feeding groups. Of course, there are degrees of conviviality. 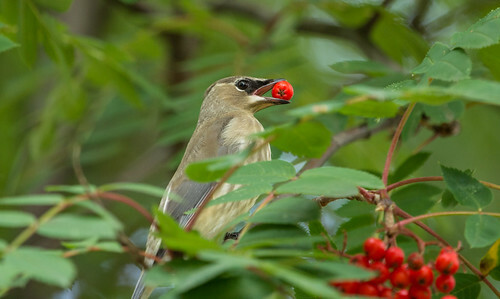 There can be 20 or 30 Cedar Waxwings in a single mountain ash, but seldom will there be more than 2, and usually just one, per cluster of berries. I don’t think I’ve ever seen waxwings pass berries to one another in fall—their mission seems entirely about devouring as many as they can, laying on fat deposits that will help them over days of scarcity come winter. This week I’ve been hearing waxwings wherever I go in my neighborhood or up at Hawk Ridge, and Thursday I spent a little time in my yard and my neighbor’s taking photos. 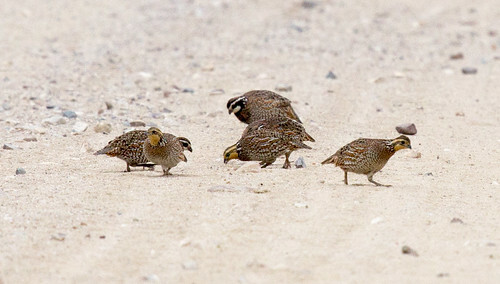 The flock I spent time with included a lot of young birds, which have streaked breasts and a somewhat shaggier crest than adults. The waxwings are in the company of thrushes as well. 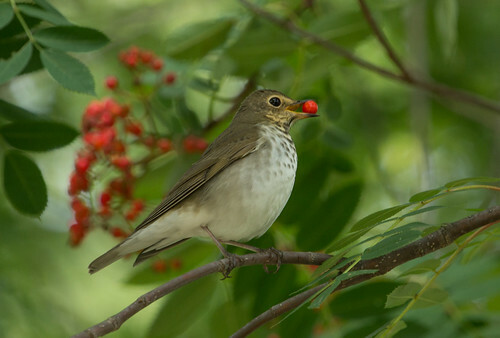 Most are American Robins, but a good number of Swainson’s Thrushes have also been hanging out this week. 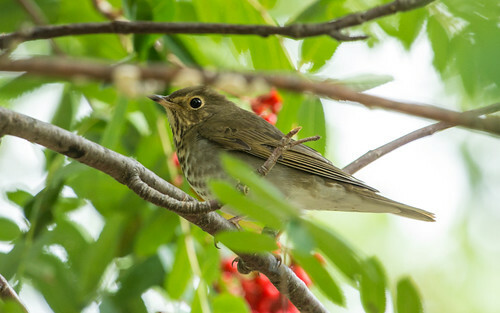 The thrushes seem rather meek and mild—when I’ve watched a waxwing fly to a branch near a Swainson’s Thrush, the thrush always flew off to another branch. The American Robins are the bullies of the crowd—several times I’ve watched one fly straight toward a waxwing or Swainson’s Thrush at high speed. 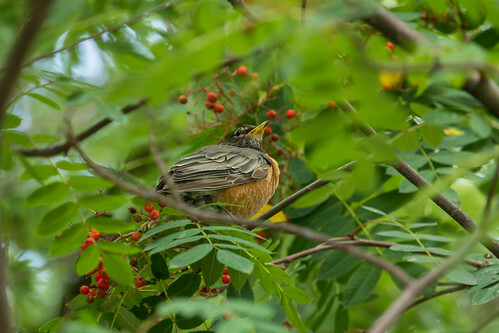 Instantly the smaller bird flies off, leaving a good bunch of berries to the robin. Even though virtually all the birds in these trees right now have been Cedar Waxwings, Swainson’s Thrushes, and robins, I keep looking through all the branches in hopes of an outlier—a Red-eyed Vireo is often flitting about in the same trees, presumably eating a berry or two to sweeten its usual buggy fare. 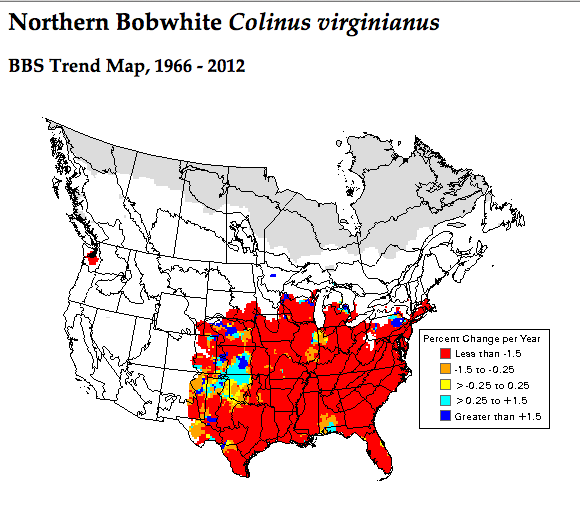 Nashville Warblers and American Redstarts were among them there earlier in the week, but they seem to have left with the drop in temperatures. The one time I had a Townsend’s Solitaire in my yard was during fall migration, mixed in with a flock of robins and waxwings. Hope springs eternal. With or without outliers, watching and photographing just the common species has been delightful. 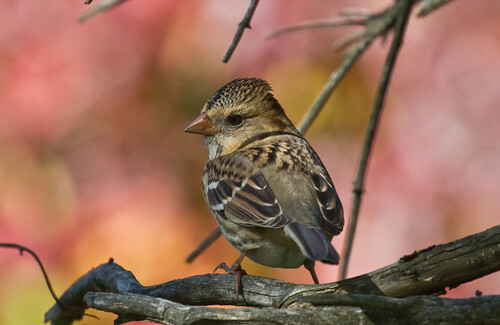 September is one of the months that could use an extra week or two, just to pack in all the wonderful bird activity. But it always ends after 30 days, just as the berry supplies inevitably dwindle—in just a couple of days, the birds almost completely stripped my favorite mountain ash of its berries. Just as the birds are grabbing for all the berries they can, while September is here, we’ve got to grab for all the gusto we can. Check out the events for this year's Hawk Ridge Weekend. I'll be speaking about all the fun I had on my Conservation Big Year on Friday night, and leading a boat tour of the St. Louis River on Saturday morning. 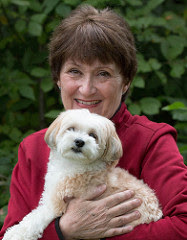 On September 15 and 16, 2014, I was behind on several projects and was stuck at home. But northwest winds, clear skies, and something deep in my bones kept telling me things would be hopping at Hawk Ridge. I live in the neighborhood right below the ridge, but often miss seeing many raptors on the big flight days, though I can usually tell a day is good by the songbird activity in my yard. Monday, birds were really moving about. 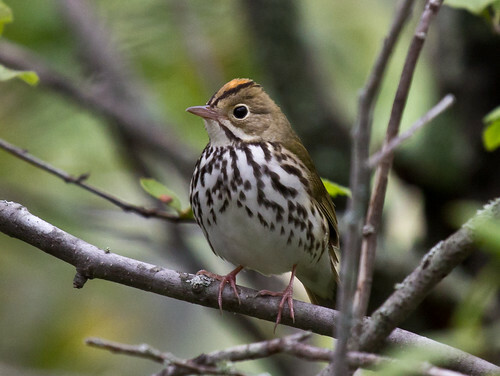 I couldn’t spend too much time looking out the window, but did spot a Black-and-white Warbler, a couple of American Redstarts, and a Palm Warbler in addition to a dozen or so White-throated Sparrows. 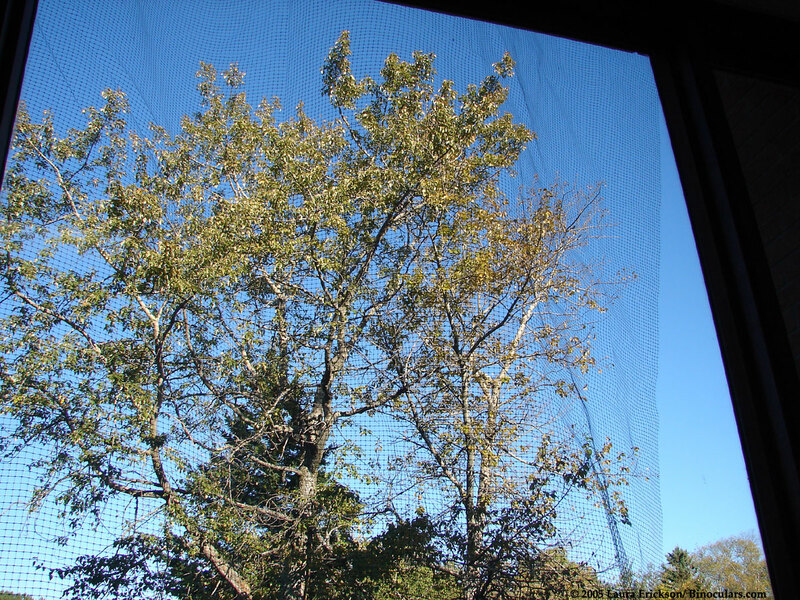 I didn’t need to look out to be aware of lots of Blue Jays—their squawking not only told me they were around but that one or two Sharp-shinned Hawks were cruising down Peabody Street. I checked the count via the website at Hawkridge.org that night, and 6,622 hawks had gone by—the biggest day so far this season. 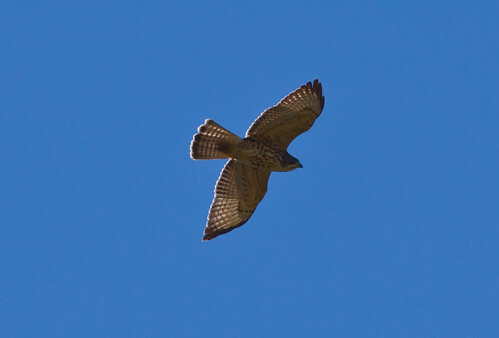 As usual when the count is so large, the vast majority of the birds—over 5,500—were Broad-winged Hawks. When we have a big day like that, the following morning is often quite good, too. That’s because the birds coursing through at the end of a big day have to land somewhere for the night, so are usually seen taking off the next morning. Back in the 90s, the morning after a September day when the count was over 20,000, I got phone calls from three different kids working at supermarkets, telling me about the huge numbers of hawks circling over the parking lots. Dark pavement is first to warm up as the sun climbs in the morning sky, so the first useful thermals of the day often develop over parking lots and highways. 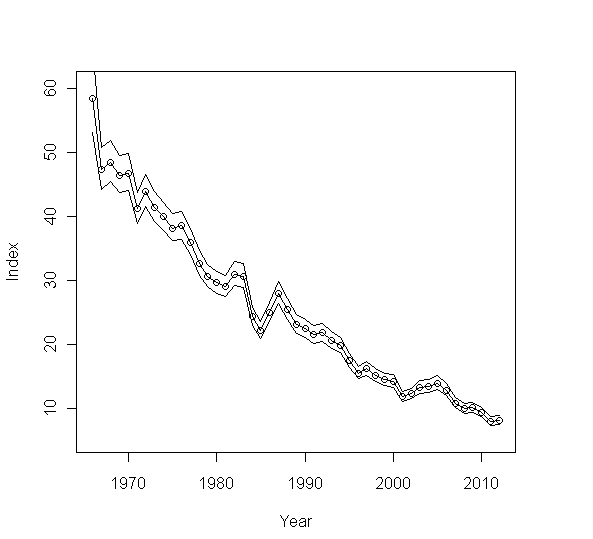 On the biggest days of all, hawk numbers are highest at midday, but so is their flight. 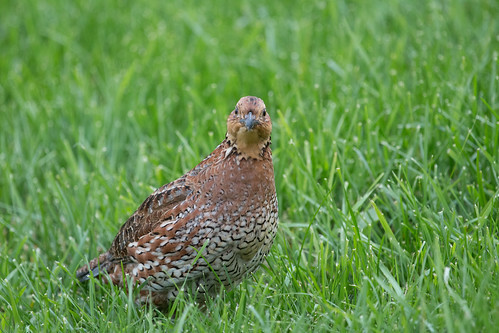 You’ll see fewer birds but they’ll be closer during early and mid morning. Tuesday held to that pattern. Mike Furtman posted beautiful photos he took Tuesday morning on facebook. But powerful winds kept the numbers lower—those winds break up the thermals. By day’s end, the total was 801, with the Broad-wing count at 329—an order of magnitude lower than Monday, but darned respectable. Wednesday started out with light winds from the southwest. When I woke about 6:15, I spotted a thrush outside my window in the semi-darkness, and a few minutes later, the first bird I spotted from my office window was a hummingbird. I couldn’t get away immediately, but headed up to Hawk Ridge at 10 am for a couple of hours. The counters were busy tallying small kettles of Broad-wings and flocks of Blue Jays and the occasional small flock of Pine Siskins, and I got busy photographing a Lapland Longspur who showed up at the main overlook and stuck around the same spot for a long time while people took pictures. 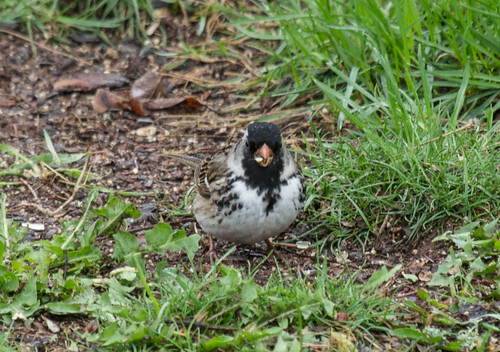 Unfortunately, the last photos I’d taken were in a dark setting and I had my ISO set to 2500, but the bird was so cooperative in such perfect light that the pictures turned out not too bad. 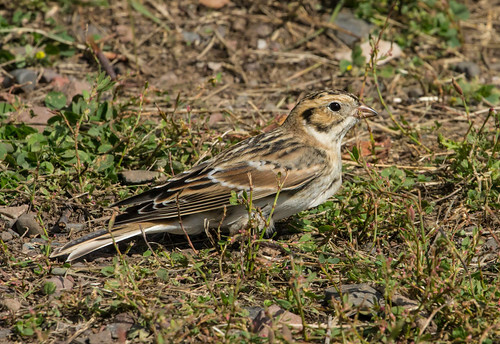 Lapland Longspur at Hawk Ridge! The wind shifted to the east and the temperature dropped dramatically right about at noon when I had to leave anyway. I’d had a great day, and the final count ended up being 2,941, with the Broad-wing total at 2,451—less than half of Monday’s numbers, but thrilling nonetheless. Anything can happen in mid-September—sometimes we have single-day counts well into 5 digits, but it’s always hard to predict. Our current Broad-wing total for the season is now over 16,000. This weekend is Hawk Ridge Weekend, and the weather may not be ideal, but when the winds shift to the northwest again, we could get a humongous day. Or not. 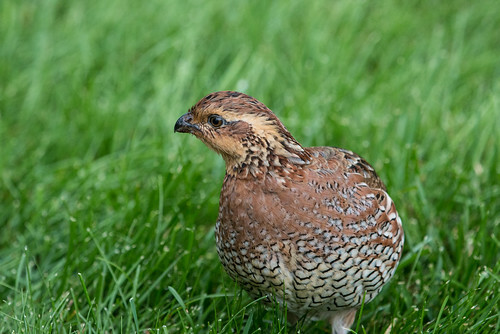 Whatever happens, birding up at Hawk Ridge in September is like a box of chocolates. You never know what you’re going to get, but it’s certain to be sweet. 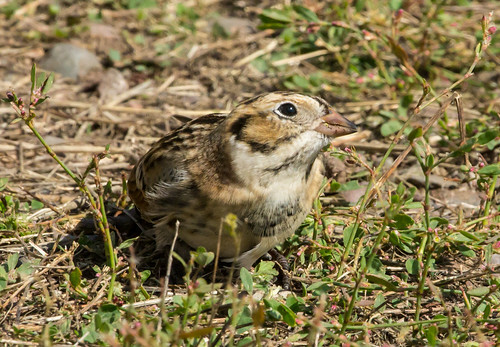 Lapland Longspur casting an eye to the sky. 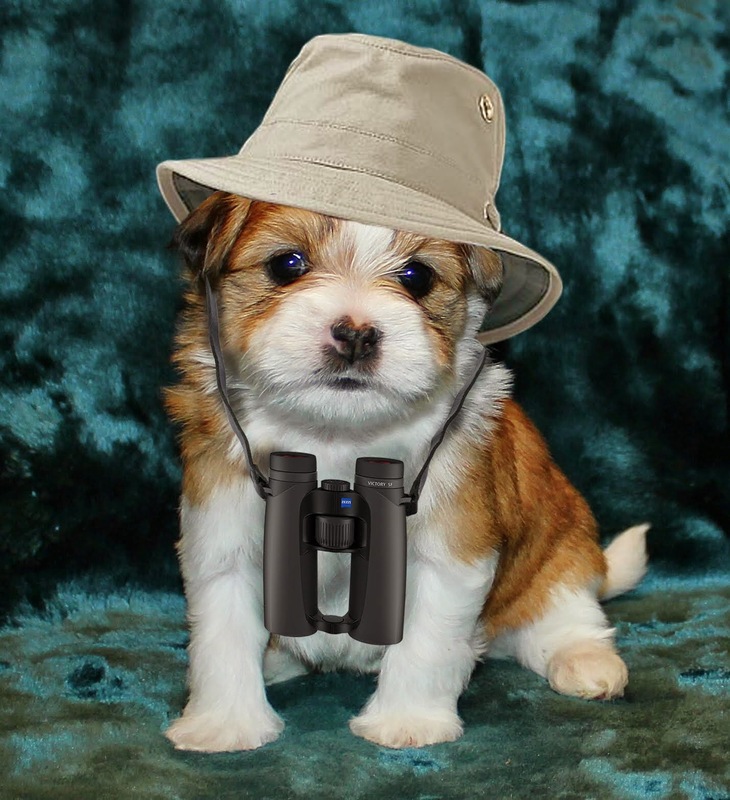 Looking for hawks? Last summer, the Princeton University Press released a book by Tom Stephenson and Scott Whittle, The Warbler Guide. When I first read about it, I admit I rolled my eyes thinking, “Not another one!” My library already included four field guides specifically about warblers. They’re all good in one way or another, but I don’t usually consider field guides to families to be useful, especially for beginners, because they don’t show similar but unrelated birds that can be confusing. (The great comprehensive guides to families are a different story.) 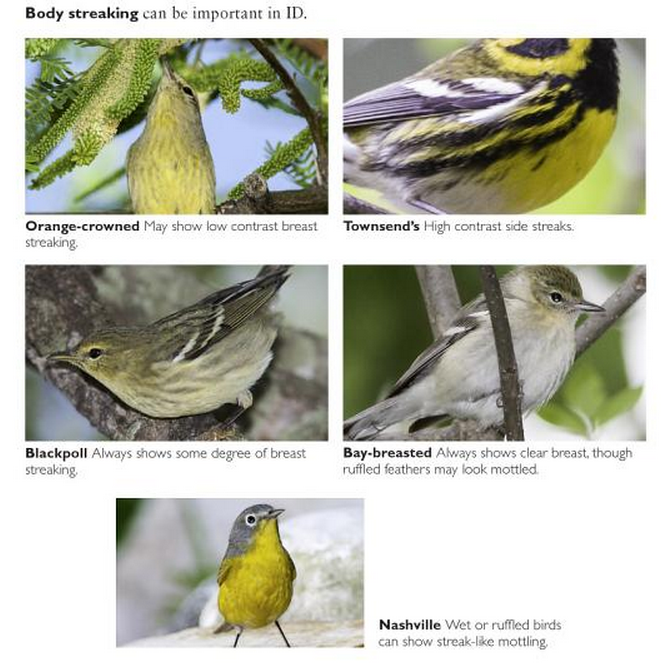 The Peterson guide to warblers is wonderfully comprehensive, but even that one is worthless in the field when someone is starting out and isn’t sure whether a particular bird is a flycatcher, vireo, kinglet, or warbler. But it’s very true that birders of all levels are drawn to warblers, and anything that makes identifying them easier is a Good Thing, and the publishers sent me a free copy, so I opened it. And WHOA! The Warbler Guide is a game changer. 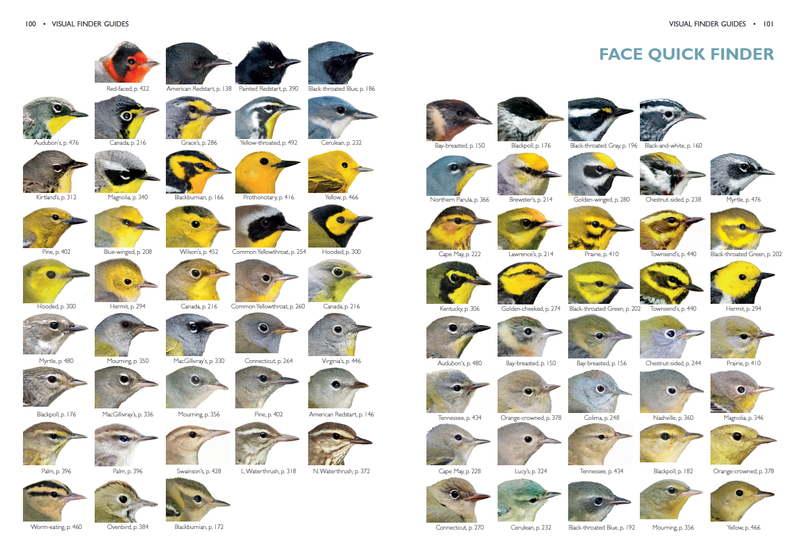 The 137-page section that starts the book is a brilliant tutorial in the basics of warbler identification—both by sight and sound—using a methodical, objective approach that would benefit anyone studying any group of birds. It so thoroughly covers identification both by appearance and vocalizations that I want to highlight the two sections separately. In their “Topographic Tour,” Stephenson and Whittle use brilliant colors to outline different feather groups and body parts within a nice color photo, rather than using a simple line to point out the general area of what could be a large or small structure not so easy for beginners to figure out. David Sibley in his Birding Basics used black-and-white line drawings, and Kenn Kaufman in his Advanced Guide to Birding brought it to the next level with black and white outlines next to actual photos to show the particular feather groups and body parts, but Stephenson and Whittle bring this clear-minded approach to the next level. 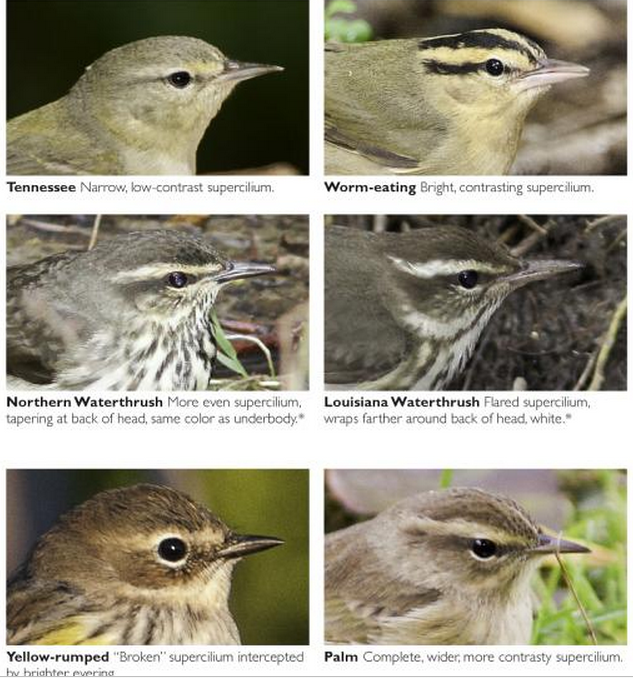 The 40-page section on things to pay attention to when looking at warblers is rich in photos showing each feature on different species and, where pertinent, on similar non-warblers. 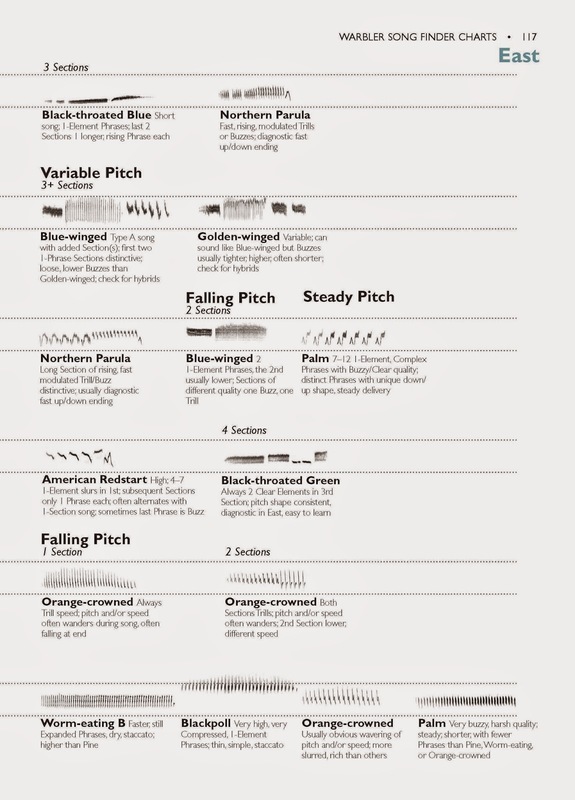 Bill shape and length, eye rings, eye lines, length of the tail and how relatively long or short the undertail coverts are—all these features and more are thoroughly covered, and reading this section will make anyone more able to discern a bird’s important features. 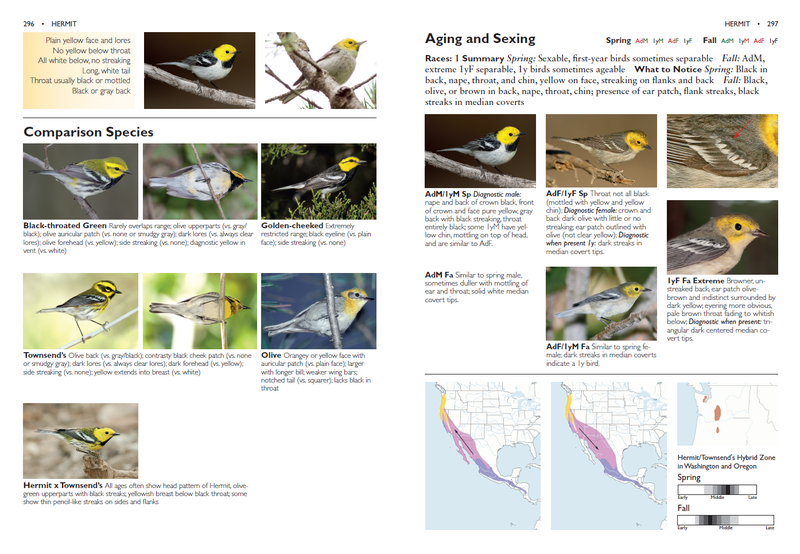 The section is rich with photos clearly comparing and contrasting each feature on different warblers and non-warblers. There is also a section on aging and sexing warblers—and the authors show how this is fairly straightforward with some species but virtually or completely impossible with others. They use wonderful drawings by Catherine Hamilton to illustrate points more clearly understood and compared with drawings than photos. There are also nine two-page spreads called visual finders. 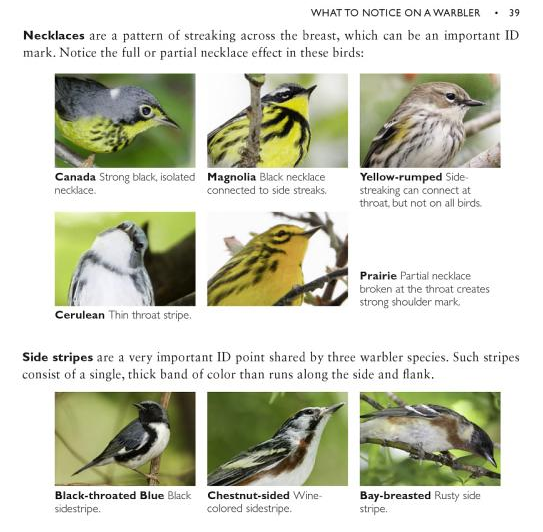 These pages are an absolute treasure, and are, amazingly, all available as free PDF downloads on The Warbler Guide website, though I personally wish the publishers would also sell eastern and western versions as laminated, folded guides. These visual finders show all the species together so you can make a quick guess before thumbing through the species pages. One shows all the warbler faces in profile, another the whole body in profile, a third the side profile from a 45-degree angle, when we see more of the underside and less of the upper body, and a fourth from directly beneath. 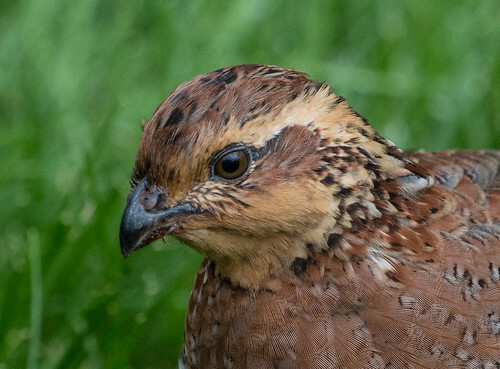 They repeat the full body profile views with another 2-page spread limited to eastern species in spring, another for them in fall, and have a single 2-page quick finder for western species. Finally, they use Catherine Hamilton’s drawings to compare close-up views of the under-tails of every eastern and every western species. Of course, the meat of the book is in the 354-pages of species accounts. 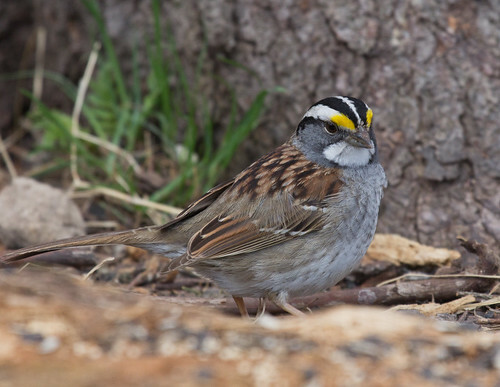 These include a wide array of photos of each bird with comparison photos of similar-appearing species, listing all the bird’s features and highlighting with a check the features that in and of themselves are diagnostic. For example, if all you can see on a warbler hidden by foliage is a bit of its undertail, but notice black “arrowhead” markings on a white background, you for certain are looking at a Black-and-white. 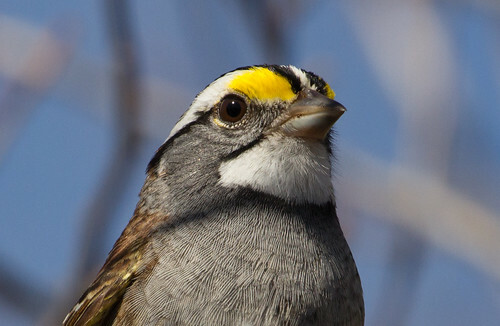 Some straightforward warblers, such as the Black-and-white, are covered in 6-pages, while those with more plumages or which can be easily confused with others, such as the Blackpoll, can have as many as 10, and the Yellow-rumped, which has different plumages for eastern and western forms, is covered in 12 pages. The Warbler Guide is the perfect book for learning warbler plumages—stunningly beautiful, and fun as well as instructive. And it goes above and beyond that, with the most comprehensive coverage of warbler sounds I’ve ever seen. 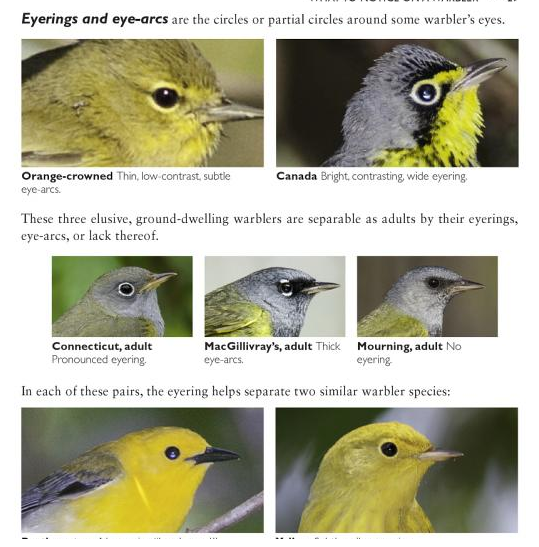 I absolutely love The Warbler Guide's thorough coverage of visual identification. 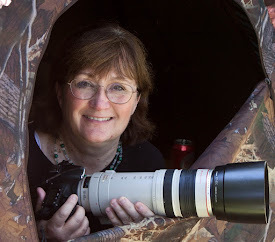 But the book is a game changer in another way, too, providing the best tutorial in learning bird songs and calls I’ve ever seen, with liberal use of spectrographs of sounds, called sonagrams, throughout. Many people find these graphs of sound scary and confusing. 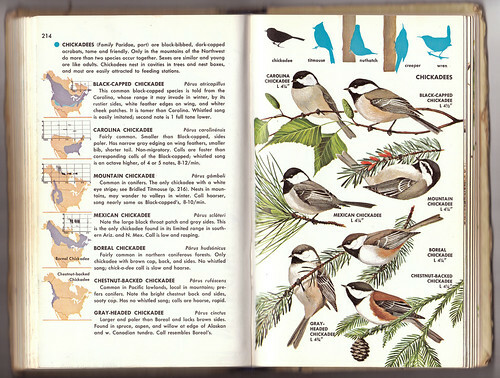 My trusty Golden Guide, the field guide I used in the 1970s when I started birding, is the only field guide I’ve ever seen that uses sonagrams. I suspect that the reluctance of people to figure them out kept other field guide authors from using them. I intuitively grasped many of the concepts of sonagrams from the start, because I can read music, but it would have been enormously helpful for me when I was starting out to have read The Warbler Guide’s 38-page tutorial, and also to have been able to see a lot of sonagrams for each species, to better grasp the many different songs a single species can produce. This tutorial explains how to go about learning warbler songs, interpreting the sonagrams while listening to the exact corresponding sound via “The Warbler Guide Song and Call Companion,” available as a download for $5.99 via thewarblerguide.com. I downloaded the Companion, which has over 1,000 short sound files, and set it up in iTunes to play each sound on repeat until I advanced it manually to the next sound. Then I read the introductory section about learning warbler sounds while sitting at my computer with iTunes open. 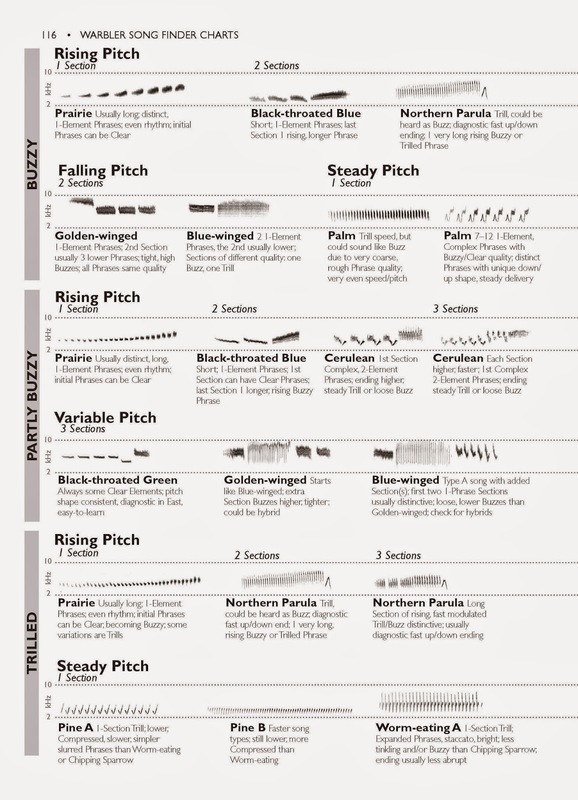 This was the perfect way to get a visceral appreciation of how to interpret the spectrographs of bird sounds, and to get a far clearer, more objective understanding of what to listen for while identifying bird sounds than what field guides traditionally show. Even if you can’t afford the $30 Warbler Guide, I strongly recommend checking it out of a library, paying the $6 to download the songs, and doing that tutorial. 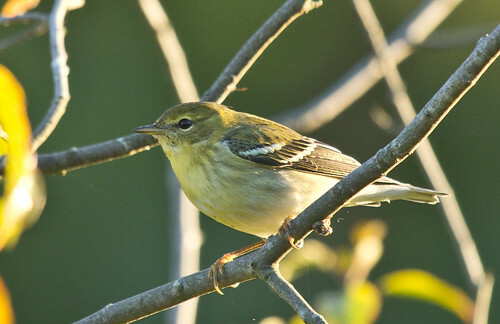 Learning what to listen for on warbler songs will make distinguishing the songs of other families much easier, too. 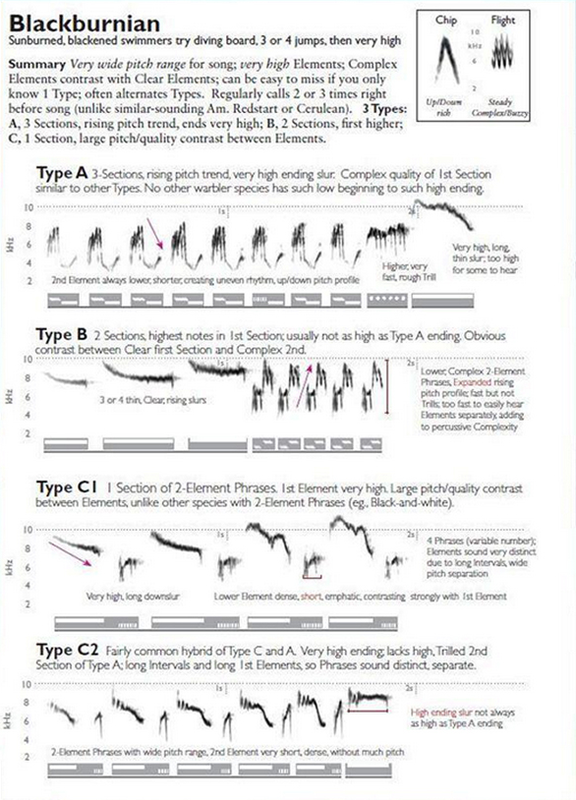 After the basic tutorial on how to listen to warblers comes what the authors call their “Song Finder,” in which they group the sonagrams of similar sounds together, so you can see the spectrographs and read their clear explanations of the differences while you listen to the sounds. After you’ve gone through that amazingly in-depth but enjoyable tutorial, you can head straight to the individual species accounts. 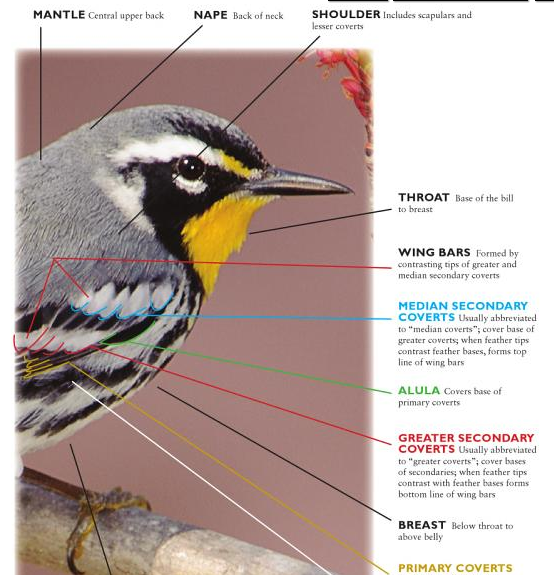 Just as The Warbler Guide provides visual comparisons for each bird, it provides sounds, too. 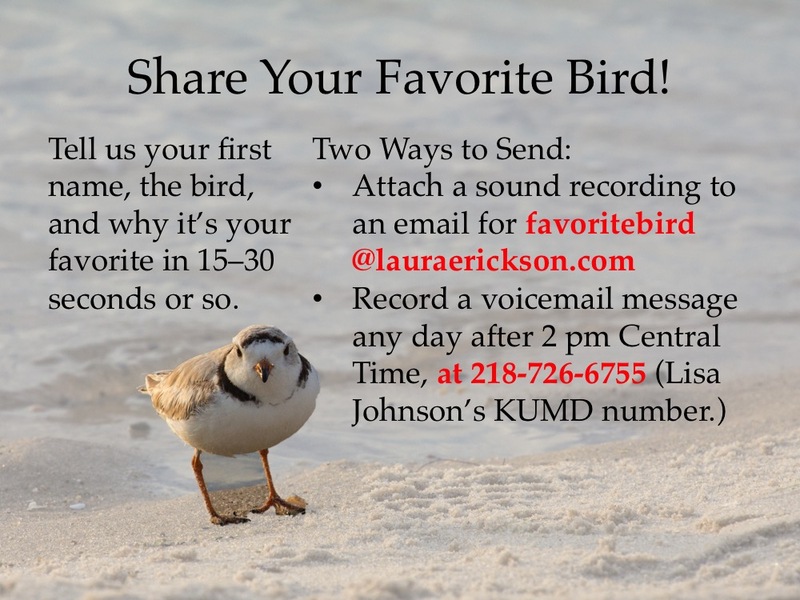 The song treatment is extraordinary, covering the different types of songs, call notes, and nocturnal flight sounds for that species along with similar-sounding vocalizations from other species—again, downloading that sound download provides extraordinary in-depth coverage for each species. I would not recommend trying to read and listen to the entire Warbler Guide: after the initial tutorial, I’d prioritize the species by which you want to learn first. 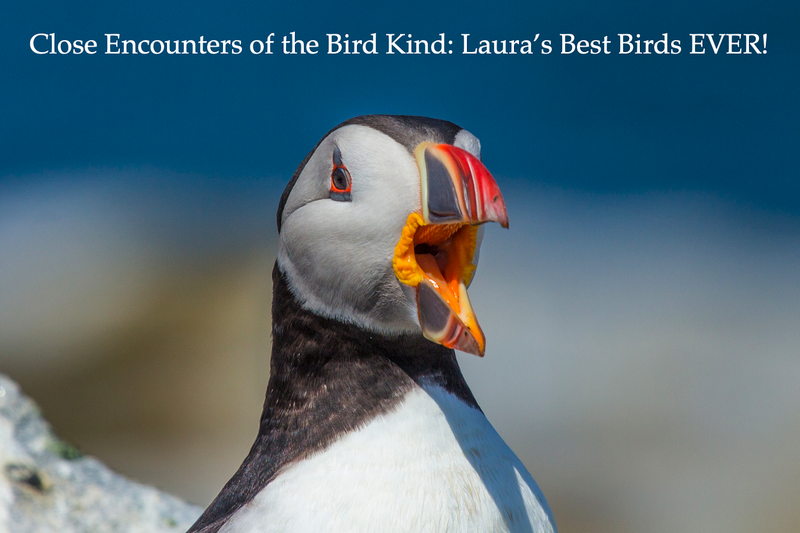 I got a free review copy last year, but love the book so much that I paid for a second copy when the authors were at the popular Ohio birding festival, The Biggest Week in American Birding, this year, so I could get it autographed. 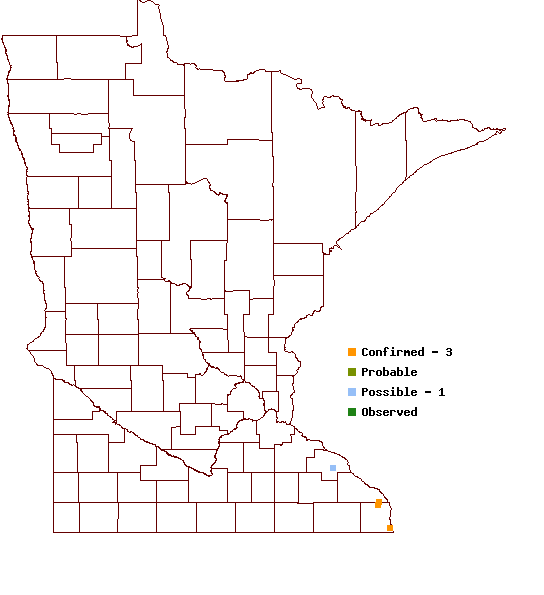 Most of the early fall warblers have passed through the north woods now, though as of September 15, there is still a good variety out there. 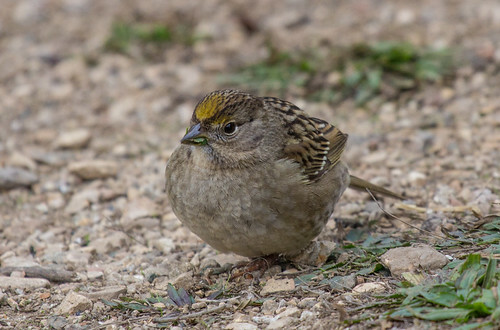 This would be an excellent time to start reading The Warbler Guide and listening to the companion guide while you get more comfortable identifying Palms, Yellow-rumped, and whatever others are still hanging out. And spend a rainy afternoon or evening on that tutorial at the beginning. Then keep thumbing through those species accounts now and then throughout the winter, and by next spring, you’ll be identifying warblers like a pro. You’ll be so glad you did! 560 pp. | 6 x 8 1/2 | 1,000+ color illus. 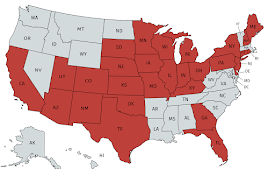 50 maps. Also, what sounds like a great app for The Warbler Guide will be coming out in time for Christmas. I can’t wait to see it! Most of the warbler photos in The Warbler Guide were shot with flash. Based on my observations of my education owl Archimedes when people take his picture in various lighting situations, and on my observations of songbirds at various birding destinations when photographers use flash, I don’t think flash bothers birds much, or even at all, in daylight. But the bright dot or weird reflections in the birds’ pupils on some of the photos did bother my aesthetic sensibilities. The most egregious case was their photo used to illustrate a Canada Warbler’s eye ring. The weird and large white reflection in the pupil could confuse beginners about what and where the eye ring is—I wish they’d photoshopped that out. The Canada Warbler photo they use to illustrate its bill size and shape would have been a better choice for showing the eye ring. The fact that this is the only thing about this entire wonderful guide that I take issue with is pretty darned impressive.